Tabletop RPGs have always been imposing to me, at least from a distance. I’ve dabbled in Dungeons & Dragons before, but it’s hard not to be overwhelmed by the freedom of tabletop and retreat to the ironically comfy restrains of a videogame. 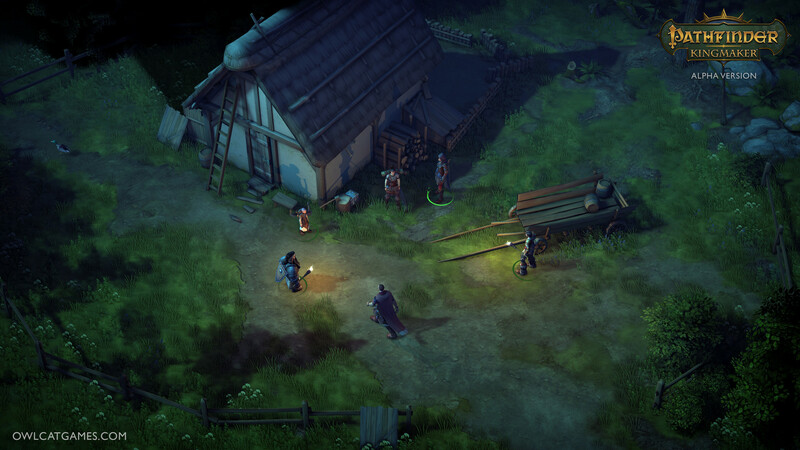 Pathfinder: Kingmaker is interesting in that it’s trying to be as close to its tabletop namesake while still being somewhat more accessible to those of us more accustomed to videogames. I’ve only admired the likes of Baulder’s Gate from afar, but it’s easy to see the influence Pathfinder: Kingmaker has taken from those old Bioware titles. The demo began several hours into the game with a full party being greeted by two warring goblin factions. I could assist either side, remain neutral, or take advantage of the situation and kill off both, so I chose the last option. There is an immense breadth of dialogue options and actions at your disposal. Typically, I chose the ‘good’ routes in RPGs, but just the fact that Pathfinder: Kingmaker gave me the option to be this villainous was enough to go through with the act. Quickly into the demo that old feeling of being overwhelmed by the sheer volume of options and content hit me. There’s the world in Pathfinder: Kingmaker really is yours to tailor, and normally a game like this requires frequent visits to an online wiki. What’s great about this game though is it basically has its own in-game wiki. If you are stuck at all or need to research a mechanics or gameplay systems, there’s a menu in-game that lets you search up whatever you want. It may not sound like a big deal, but again for newcomers, it’s easy to feel lost in this kind of RPG. Having all information at your fingertips without having to open a web browser is a huge plus. There’s some degree of micromanagement when it comes to combat in Pathfinder: Kingmaker even though it’s real-time. It’s best to pause and issue orders rather than rely entirely on the AI to fend for themselves. Depending on your character and their companion’s roles, it might take a little getting used to where everyone should be on the battlefield. For instance, one of my companions was able to detect and disarm traps, so I tried to have her lead the party and clear the path as I explored. Something that makes Pathfinder: Kingmaker stand out is the city building aspect of the game. You will be able to take land and establish new settlements to expand the kingdom. Doing so will affect your reputation with NPCs and influence dialogue choices. Even just exactly where your buildings are placed may sway how some characters interact with you. Character customization is very in-depth in Pathfinder: Kingmaker. If you’re the sort of person that likes to modify every aspect of your character’s personality, backstory, and looks then you won’t be disappointed with this game. There is character pre-sets for those looking to just jump in, but the customization goes to the point where you can even upload pictures from your desktop to represent your in-game avatar. Admittedly there was a lot of information to take in during my short demo with Pathfinder: Kingmaker, but all the same, I walked away impressed. It’s a game made for die-hard tabletop enthusiasts and CRPG faithful but there’s enough care put into it that newcomers won’t be totally scared off. For me at least, there was enough to entice me and want to learn the various systems once the game comes out proper on September 25th.